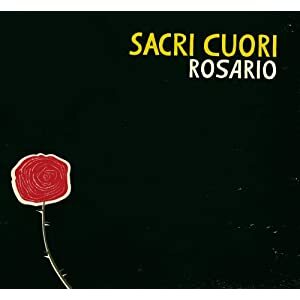 This album has been in heavy rotation here at Blabber’n’Smoke ever since we were able to get a copy at Sacri Cuori‘s superb gig with Dan Stuart at King Tuts last month. From Italy and primarily an instrumental band press releases and record label notes would lead one to expect a spaghetti western version of Calexico and that’s a little bit unfair on the band as they have much more to offer than dust blown soundtracks to non existent cowboy movies. Having said that there’s no doubt that they are influenced by the sounds of the American south west. Their first album, Douglas & Dawn was recorded in Tucson with some of Giant Sand and Calexico in attendance and John Convertino appears here. However there is a heavy European influence also present which is dominated by the music of Nino Rota, best known for his film scores for Fellini and The Godfather theme, with whirls of circus like tumbles and mournful swollen horns such as tuba recalling his dizzying work. Elsewhere there are glimpses of Joe Meek’s clockwork science fiction sounds and occasional glimmers of Krzysztof Komeda. Essentially a trio (Antonio Gramentieri, guitars, Christian Ravaglioli, various keyboards and wind instruments and Francesco Giampaoli, bass) Sacri Cuori are expanded here with Diego Sapignoli providing various percussive effects and sound samples while Enrico Mao Bocchini drums on several tracks while Denis Valentini adds percussion and horns. Ravaglioli and Sapignoli in particular beaver away on so many instruments with the result that the album is a multilayered cornucopia of delights while Gramantieri evokes surf music, Santo and Johnny’s Sleepwalk, The Lounge Lizards jazz noire and Link Wray. While they proved at King Tuts that they can pull this off live as a quartet on the album they are joined by a stellar cast of supporting players including Convertino, Jim Keltner, David Hidalgo, Stephen McCarthy, JD Foster and Marc Ribot. Although this is essentially an instrumental album another star guest opens the proceedings as Isobel Campbell sings the opening Silver Dollar. With her trademark whispy voice Campbell croons as the band swoon around her in a dreamlike state with keening lap steel and banjo from Stephen McCarthy. Like a Lee Hazlewood song scored by Angelo Badalmenti it’s a fine curtain raiser. Campbell reappears and does another fine job on Garrett, East, a relatively unadorned song featuring Dobro and prepared piano that is delicate as gossamer. It’s worth noting that Campbell wrote the lyrics for both songs. The remainder of the album is an atmospheric broth of tunes with only occasional voices, sampled or sung, to add colour. While each and every one has its own beauty and repeated listens reveal new delights a few gems merit mention. The stately slow tango of Fortuna has some outstanding guitar work from Gramantieri while Lido recalls the Cuban sensuality captured so well by Ry Cooder and Manuel Galban on their album Mambo Sinuendo. Sipario’s swirling keyboards revisit the heady delights of Rota’s Amacord while Teresita starts off with Tex-Mex keyboards before the song swirls into outer space. Finally the juggernaut drive of Sei takes the listener down dark menacing highways with squalls of guitar, screeching horns and a disembodied voice. Short and to the point if David Lynch decides to remake Lost Highway he’s got his opening song right here. This album is ridiculously good. As we have said it repays repeated listens as the ear discovers and hones in on yet another fine detail and the mind paints pictures to go with the music. Hopefully it won’t be long before these Italian suoni maghi are back in Glasgow to thrill and delight us. Canadian trio Picture The Ocean are touring the UK right now promoting their fine self-titled album. Previously a duo called Jesse Dee & Jacquie B they’ve got a new buddy in the shape of Matt Blackie who drums and allows them to capture their studio sound live. While we’ve only heard one song from the new album, the organ driven Erewon the duo have proved themselves to be fine purveyors of dramatic and widescreen American epics such as Straggler from their Our Ghosts Will Fill These Walls album. Sounding at times like a less grungey White Stripes they’re big in their native Canada and this is their first European jaunt. They’ve played the first gigs of the tour by now but they turn up in Glasgow on Sunday at the Griffin bar and in Edinburgh the following day before heading south. A rare chance to catch a fine band in an intimate setting. Mary Gauthier. Live at Blue Rock. Mary Gauthier is a particular favourite of Glasgow Americana fans having appeared here regularly and always beguiling the audience with her world weary observations, her trials and tribulations. So news of a live album caused some excitement at the Blabber’n’Smoke newsdesk and having finally arrived it proudly sits, a true, fly on the wall, unenhanced capture of a show, warts and all. Gauthier bares her soul, intense, emotionally connected to the characters she sings about. Supported by Tania Elizabeth on fiddle and Mike Meadows on percussion this almost amounts to a greatest hits compilation with selections from most of her albums although surprisingly only one from The Foundling, her autobiographical and award winning album. With all of the songs well delivered its difficult to select highlights although one has to mention the sterling work by Tania Elizabeth whose fiddle playing is superb with a raw tortured feel about it adding a sense of drama to what are already fairly dramatic songs. However Gauthier’s delivery of Last Of The Hobo Kings is spinechilling while Our Lady Of the Shooting Stars is on a par with the best of Leonard Cohen’s sixties output. Our personal favourite here is Karla Faye, the stark tale of a drug raddled Texan prostitute who ended up on death row. The trio absolutely gels here wringing all the emotion out of the song. Karla Faye is followed by Gauthier’s most famous song, I Drink which again sounds superb with excellent fiddle from Elizabeth. The album ends on a raucous note with a spirited rendition of Wheel Inside The Wheel with dervish fiddling and Gauthier totally in command vocally. Cool and assured she rocks here with a vengeance. A great end to a great album although there is an unlisted (and very fine) version of Mercy Now with gospel sounding backing vocals which acts as an encore. An essential buy for Gauthier fans. She’s coming over to play some gigs promoting the album, unfortunately no Scottish dates mentioned so far. The Ballachulish Hellhounds. Red Eye’s Motorcycle Blues. More homegrown Americana this time from the well kent (if you frequented The Captain’s Rest or attended any Scottish “bijoux” festivals over the past few years) Ballachulish Hellhounds. The Hellhounds are another band in thrall to old time American music and live they whip up a storm. Their debut album in 2010, Songs from The Great Atlantic Ocean was a fine mix of traditional and self penned songs that celebrated the long standing connection between the folk traditions of the old and new worlds. Our only quibble with the album was that it seemed a mite thin in the production failing to quite capture the energy and sparkle of their live shows. No problems this time around as Red Eye’s Motorcycle Blues positively jumps out of the speakers with a fire in its belly. With six songs and only available as a digital download this mini album is intended to bridge the gap between the release of their debut and their next all original long player (promised for next year). One thinks the Hellhounds are short-changing themselves here as it stands up to scrutiny while promising much for the next album. In particular the title song, written by the band, is a fine tale of a farm boy itching to join some motorcycle rebels and failing. Delivered with a sly drawled vocal from Zander McFarlane it has a jaunty old time country feel and one can imagine Ry Cooder or Mike Wilhelm having great fun with this. Iron Horse/Born To Lose which, believe it or not, is a cover of a Motorhead song is the other stand out here. In the absence of power amps the Hellhounds drench the song in swathes of acoustic guitar in a melancholy mode with a sixties Byrds type feel although its not the jingle jangle Byrds, more like David Crosby’s internal meanderings. The remainder of the album is of a traditional nature. Long Gone and Rabbit In A Log are fast and furious with the banjo and mandolin frantically flailing away. Lonesome Without You is a Carter family type singalong. Expertly delivered it recalls the likes of The Louvin Brothers and other greats of country music tradition. Bury Me Beneath The Willow which closes the disc is another old time tune which has been recorded by everyone and his uncle and the Hellhounds deliver a great version with some great solos on Dobro and mandolin but overall it’s the ensemble playing and fine harmonising that show that they truly capture the essence of old time Americana. All in all a great little album. The Kingmakers. Last Night In Nashville. The Kingmakers are yet another Canadian group who have picked up the baton of Americana and carried it over the 49th parallel. However unlike the majority of acts we’ve reviewed here who delve into bluegrass, singer/songwriter musings or country music The Kingmakers are unashamedly rockabilly and proud of the retro tag that comes with this. So proud in fact that they’ve recorded in the Sun Studios in Memphis in the past and on this, their third album, shifted to Nashville to record the album at Cowboy Jack Clement’s studio, Clement being the man who recorded and produced much of Jerry Lee Lewis’ Sun output. In addition they’ve persuaded The Jordonaires to sing on a few of the songs while JM Van Eaton, Jerry Lee’s drummer joins in on the fun. First thing to say is that this is great fun. Pump up the speakers and pretty soon it’s difficult to stay seated as they run through some amped up rockers and swingingly good fifties teen toe tappers. With only one cover, Van Eaton’s Memphis In ’55, their songs, mainly written by bass player Steve Donnelly, have an authentic touch that we’ve not heard since The Blasters announced their mission to reclaim American music. Indeed the opener Well Well Michelle and Johnny Green could sit comfortably on a Blasters album while Beale St. Memphis TN Morning After Blues, a deliciously loose and slinky blues number has the Alvin brothers stamped all over it. To show however that they are no mere copyists the band have a fine zydeco influenced number in Women and Weather while Prom Night Car Crash is a great Johnny Tillotson type death song. Great fun. Coyote Grace Now Take Flight. A Seattle based trio Coyote Grace began as a duo busking at the famous Pike Place Fish Market while more recently their profile was raised on several tours in the States supporting the Indigo Girls. Now Take Flight, their fifth album, certainly supports their claim to wider acclaim packed as it is with some fine playing and above all excellent songs. The trio (Joe Stevens, Ingrid Elizabeth and Michael Connolly) impress with some fantastic harmonies while Stevens and Elizabeth both have distinctive and attractive voices. The overall sound is not too far removed from the likes of Larkin Poe, Old Crow Medicine Show or indeed the Indigo Girls themselves. Acoustic based with plenty of frills in the shape of mandolin, banjo, ukulele, accordion and fiddle these are not country songs but a very pleasant set of intelligent songs that have a radio friendly approach that would please those whose idea of roots music is the Avett Brothers. The main strength here however is in the songwriting. Stevens produces several gems including the delicate Flowers and the superb These Gray Days which captures perfectly the feel of winter malaise and which features some very impressive upright bass playing by Connolly. Elizabeth is no slouch in the songwriting stakes although she favours an earthier touch which is apparent in the bluesy stroll of Born Blind while she gets downright dirty on the slinky organ driven Kansas which manages to reference the Wizard of Oz on a tale of a groupie chasing her chosen star. Fact is all of these songs are great including a choice cover of Springsteen’s I’m On Fire. Well recommended.